Armenia, officially the Armenian Soviet Socialist Republic, also commonly referred to as Soviet Armenia, was one of the constituent republics of the Soviet Union in December 1922 located in the South Caucasus region of Eurasia. It was established in December 1920, when the Soviets took over control of the short-lived First Republic of Armenia and lasted until 1991. It is sometimes called the Second Republic of Armenia, following the First Republic of Armenia's demise. 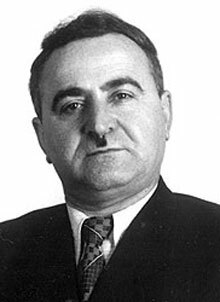 Vasil Pavlovich Mzhavanadze was the First Secretary of the Communist Party of the Georgian SSR from September 1953 to September 28, 1972 and a member of the CPSU's Politburo from June 29, 1957 to December 18, 1972. Dismissed after a corruption scandal, he was replaced by Eduard Shevardnadze. The Socialist Soviet Republic of Abkhazia was a short-lived republic within the Caucasus region of the Soviet Union that covered the territory of Abkhazia, and existed from 31 March 1921 to 19 February 1931. 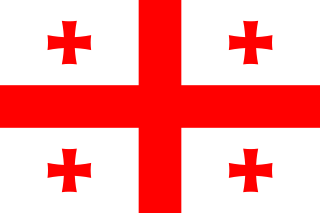 Formed in the aftermath of the Red Army invasion of Georgia in 1921, it was independent until 16 December 1921, when it agreed to a treaty uniting it with the Georgian Soviet Socialist Republic. The SSR Abkhazia was largely similar to an autonomous Soviet republic, though it retained de facto independence from Georgia, being given certain features only full union republics had, like its own military units. Through its status as a "treaty republic" with Georgia, Abkhazia joined the Transcaucasian Soviet Federative Socialist Republic, which united Armenian, Azerbaijani, and Georgian SSRs into one federal unit, when the latter was formed in 1922. The SSR Abkhazia was abolished in 1931 and replaced with the Abkhaz Autonomous Soviet Socialist Republic within the Georgian SSR. Georgian Communist Party was a political party in Georgia.